We are back with another restoration job, and this time it's the Kawasaki-Bajaj 125 RTZ - a two-stroke motorcycle. The KB 125 RTZ comes from a garage of IAB fan Vivek Muniyappa. Apart from the model mentioned above, Vivek’s parking comprises retro models Hero Puch StepMatic, Lamby 150, Kelvinator Avanti 50 and the Yamaha RX100 to name a few. 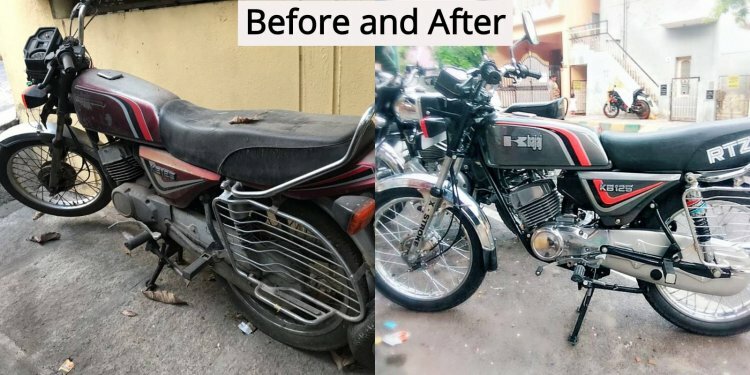 Before (left) and after (right) comparison reveals the amount of effort that was put behind restoring the Kawasaki Bajaj 125 RTZ. The bike wasn’t in its prime shape when it was purchased by Vivek in 2017. It took three months to restore the KB125 RTZ to its original form. No aftermarket parts were used to repair the motorcycle. As told us by Vivek, wheel, shafts, bearings, carburettor, piston, con-rod, magnet coil assembly, and power coil are all new original equipment. At the front is a rectangular headlight, accompanied by conventional blinkers with orange covers. Behind the light, is an analogue instrument console that comprises of speedometer and odometer on the left, fuel gauge in the centre and tachometer on the right. Telltale indicators sit above the fuel gauge. Rusted parts were given proper treatment to make them look as good as new. The wire-spoke wheels are wrapped in 2.57x18.4 section tyre at the front and 3.00x18.4 unit at the rear. The stock, 9.3-litre fuel tank and other body panels receive new paint and graphics that make it look as good as it looked when it rolled out from the showroom in 1992. The single-piece saddle cover gets RTZ branding. Behind the seat is a pillion grab rail. The rear of the motorcycle retains the stock tail lamp and blinkers. Technical specifications include a 123cc, two-stroke, single-cylinder, air-cooled engine that was tuned to deliver 12.5 bhp of maximum power at 7,250 rpm and 11 Nm of peak torque at 7,500 rpm. The engine is paired with a four-speed gearbox. The top speed is rated at 100 kmph. The motorcycle tips the weighing scale at 115 kg (dry). Drum brakes on both ends provide the stopping power. Conventional telescopic forks at the front and 5-step adjustable, twin-sided suspensions perform the shock absorption duties. Kawasaki Bajaj 125 RTZ retains all the original equipment. The restored model looks as good as new. It’s a commendable job of keeping the retro-classic alive, and we thank Vivek for sharing with IAB.